Below is a list of 4WD Parts and accessories. Click on the following links for information regarding almost each and every part of off roading accessories. Obviously not all options are available to all makes and models. Using the below list of 4 wheel drive modifications injunction with the “how to build/modify a 4WD” make it easy to see what options are available to suit your individual needs for the vehicle. 4WD-parts and accessories don’t come free so it’s best to make a list and really think about what exactly the 4WD will look like once completed. You may end up buying some 4WD parts and accessories early on which are just not compatible with other modifications later one (I have done this myself and after adding up the cost of these things I’m really thinking ahead on what I might be going to fit in the future). You buy a standard Bull Bar and 1 year later you decide to get a winch, only then you realize that the current bull bar you have is not winch compatible. Had the winch compatible bull bar been fitted from the start it would only have cost a small amount more, rather than having to buy a new bar as well or just not fit a winch. Always think ahead and weigh up the costs when you do modifications or add 4 WD accessories. Snorkels, Chips, Exhaust Systems, Turbo Charger and Super Chargers. 4x4 Lift Kit’s from 2 inches – 6 inches on Lift. Bull Bars, Rock Sliders, Brush Bars, Rear Bar, Roll Cage, Bash Plates. Long Range Fuel Tanks & Water Tanks. 4x4 Wheels and tires, 4x4 mud tires, Steel rims, Alloy rims and Tyre Monitoring Systems. Canopy, Roof Rack, Draws, Fridge and Fridge slide. Spot Lights, Rock Lights, Roof Lights, Work and Camp Lights. UHF radio, Hand Held Two Way Radios, HF, Satellite phone. Overhead Consoles, Rocker Switches, Extra Dash Gauges and other mods. Winches, Recovery Hooks/Points, Wider Wheel Arches, Rust Protection and other mods. If you want strength, quality, durability and ease of use from your 4WD awning, then congratulations...you just found it. Built tougher than anything Australia has seen before, the Ostrich Wing Awning will get you in the shade in 30 seconds and won’t break in a breeze. Forget about poles and ropes when it gets really windy you simply swing down the attached telescopic pole. Being so quick, easy and durable, the Ostrich Wing Awning will outlast and get more use than an ordinary awning, making it exceptional value for money. Made in Africa, this awning is constructed to withstand the harsh Australian climate and is backed by a two year warranty. 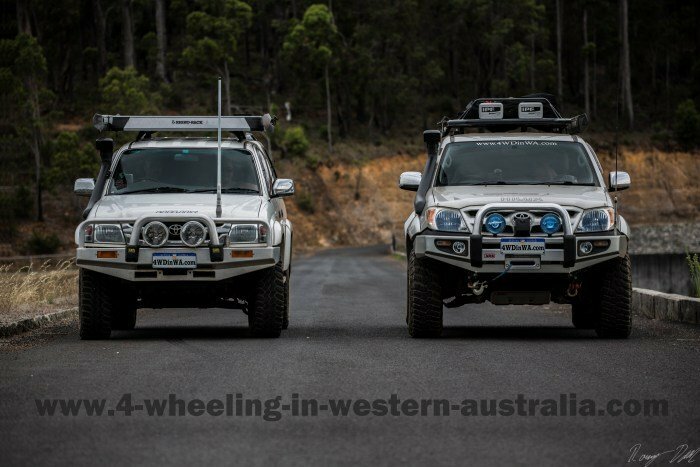 Leave 4WD Parts And Accessories And Go To 4 Wheeling In Western Australia.